Moscow Regional Ecology Ministry objects to closure of notorious landfill | Russian Legal Information Agency (RAPSI). 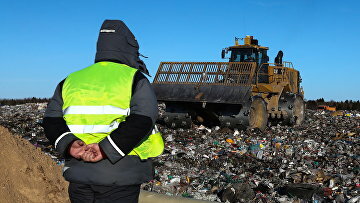 MOSCOW, July 23 (RAPSI) – The Ecology Ministry for the Moscow Region has objected to demands of the Volokolamsk town administration, which filed a lawsuit with the Moscow Regional Commercial Court seeking to shut down the notorious Yadrovo landfill site, the court ruling reads. The Ministry believes that the city administration has no authority to file a lawsuit with a commercial court. A review of the lawsuit was postponed until August 22. The defendant in the case is Yadrovo company. On June 19, the Volokolamsk City Court of the Moscow Region dismissed a lawsuit lodged by residents of the area, who asked to recover 1.4 million rubles ($21,800) in compensation from a company behind Yadrovo landfill. The plaintiffs asked to compensate their moral damages, stop collection and transportation of waste by the company and organize redevelopment measures at the landfill. According to the claimants, the company failed to meet its obligations regarding management of the site and violated their Constitutional right to live in beneficial environment and caused deterioration to the health of local residents. The defendants said that there was no cause and consequence effect between gas emissions and health problems of the plaintiffs, asking the court to dismiss the lawsuit. Local authorities also supported that motion. Earlier, the court dismissed several other lawsuits against the landfill. In March, the Volokalamsk district’s authorities initiated emergency protocol and announced measures to liquidate the consequences of ecological violations during exploitation of the landfill. Yadrovo company was fined 150,000 rubles ($2,300) by the Volokolamsk City Court. 10:59 23/07/2018 The Ecology Ministry for the Moscow Region has objected to demands of the Volokolamsk town administration, which filed a lawsuit with the Moscow Regional Commercial Court seeking to shut down the notorious Yadrovo landfill site.